Deep and quite smoky, Smokehead 18 Years Old is a very rare whisky much more impressive than the Very Young version. Ian Macleod Distillers Limited made quite an impression on peaty and smoky whisky lovers with the Very Young version. 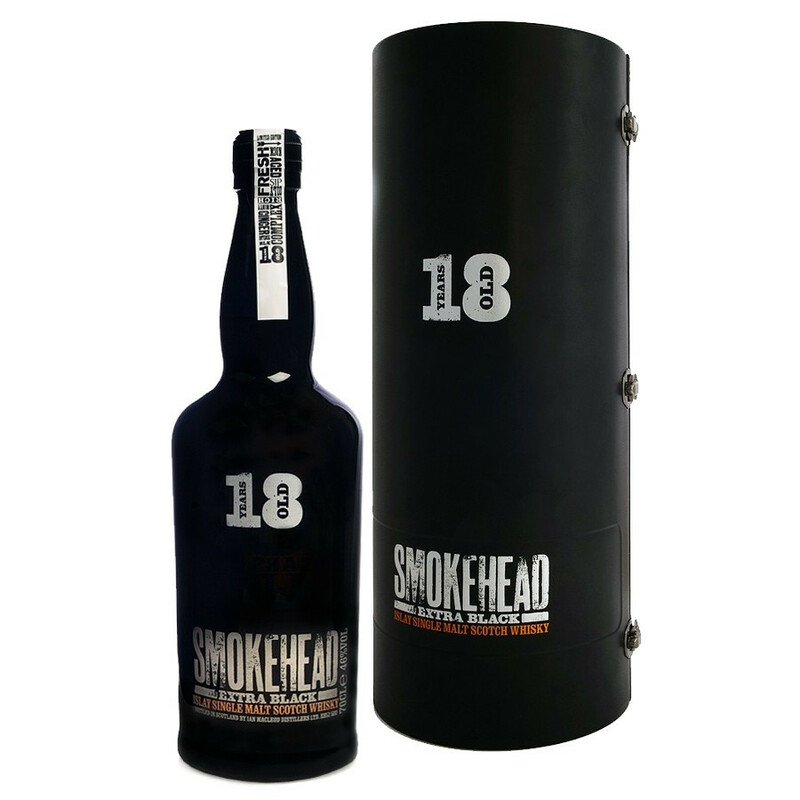 But this bold, daring and deeply smoky 18 Year-Old version goes further in intensity and power. This limited edition of 6000 signed and numbered bottles appears to be quite rich and complex with an impressive variety of flavours and aromas, on a perfectly balanced body. Kiwi, chocolate and ginger notes admirably mingle in the strong smoky fire. Smokehead 18 Years Old is a must for peated whisky lovers. For many Single Malts lovers, Islay rhymes with peaty and smoky. The most western island of Scotland (the Hebrides not included) is not very attractive, with its pebbly hills less than 500 meters high and its windswept peat bogs. But Islay is a true paradise for whisky aficionados, as it boasts the most impressive malts of Scotland. The island has many reasons why whisky production is so vibrant. Its rich soil produces the barley needed for the distillation process, water flows from the sky, the wetlands used to provide the main combustible material and cover almost a quarter of the island. Colour: gold with golden hues. Or, avec des nuances dorées. Nose: intensely smoky with minty flavours, ginger, cream and bananas aromas. Palate: slightly salty with a light clover taste. Slowly, vanilla and cocoa appear on a perfectly balanced body with a sweet, oily taste in the palate. Finish: quite long and flavoursome. The smoky flavours matches perfectly the chocolate and kiwi flavours.